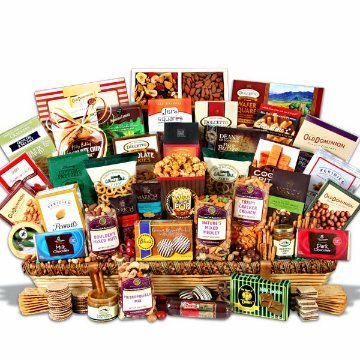 This majestic basket is perfect for conveying your appreciation to clients, team members, and family. Weighing over 20 pounds, longer than 3 feet, and laden with more than 30 award-winning gourmet snacks ready to open and enjoy, this colossal gift offers something for everyone. This gift basket includes the following: Dipping Pretzels 4 oz, Raspberry Honey Mustard Pretzel Dip 7.8 oz, Milk Chocolate Signature Bar 3 oz, Caramel Nut Crunch Popcorn 6 oz, Roasted and Salted Peanuts 7 oz, Baked Potato Sticks 5 oz, Metropolitan Mix 4 oz, Smoked Sausage 7 oz, Buttered Peanut Crunch 10 oz, Milk Chocolate Bavarian Mints 1.5 oz, Cara Mella Peanut Butter Chocolate Squares 4 oz, Chocolate Wafer Rolls 4.4 oz, Chocolate Chip Cookies 6 oz, Hors D'oeuvre Deli Style Crackers 4.9 oz, Hot Pepper Cheese Round 4 oz, Nature’s Mixed Medley 8 oz, Chocolate Dipped Chocolate Moravian Cookies 8 oz, Dark Chocolate Bar with Hazelnuts 3 oz, Chocolate Fruit Medley in Colored Shells 8 oz, Sun-Dried Tomato Basil Cheese Straws 2.5 oz, Chocolate Pretzels 6 oz, Chocolate Covered Cherries 4.5 oz, Chocolate Nut Medley 4.5 oz, Chocolate Wafer Squares 8.5 oz, Double Dipped Peanuts 4 oz, Boulder's Mixed Nuts 4 oz, Chocolate Chip Walnut Cookies 6 oz, Chocolate Chunk Shortbread Cookies 2 oz, Pure Butter Shortbread Fingers 4.6 oz, Crispy Cracker Crunch 8 oz, Cinnamon Bun Caramel Sauce 5 oz, Cinnamon Honey Dipping Pretzels 6 oz, Double Dipped Peanuts 3 oz, Butter Toffee Peanuts 3 oz, Dipped Toffee Peanuts 10 oz, Chocolate Wafer Roll Petites 5 oz, 5 O’Clock Crunch 6 oz, Butter Rich Cookie Brittle 6 oz, Mendocino County Gift Crate (dried fruit and nut mix) 33 oz, Dark Chocolate Raspberry Sticks 4.1 oz.